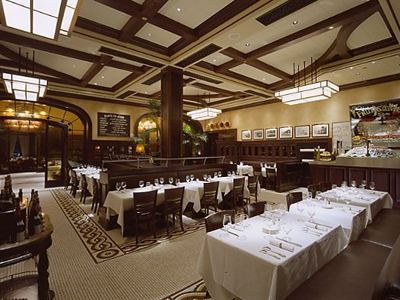 Mon Ami Gabi provides a remarkable meal as well as the feeling of experiencing the Champs Elysee in Paris. This enchanting French Bistro exudes the tastes and smells of culinary happiness. The enticing aromas of freshly prepared food coupled with the remarkable flavors in every dish will excite your appetite into a frenzy for French cuisine. Favorites such as French onion soup smothered with cheese, chicken & frites, frisee & bacon salad, not to mention the traditional steak frites, all radiate the excellence in this dining establishment. You can dine al fresco and enjoy an extensive French wine list with your meal. Also offering daily specials and a weekend brunch. We ate here for lunch. The warm goat cheese appetizer was beyond words. Best experience in Vegas. Our server was very friendly and helpful. I ordered steak and frites and when it arrived I thought I’d be disappointed when I saw the thin steak… I was in the mood for a thick cut of meat. I was pleasantly surprised though as everything was excellent. My only complaint was that our table was right next to the bar and it felt like we were constantly being swarmed by either the other servers or customers walking to their tables. It’s a must stop every time in town! We have had bacon and eggs many times on the patio and it can`t be beat. We have also had french onion soup with baguette bread for lunch and that was really good. Make sure to make a reservation bc u may still have to wait a little bit. But the wait is worth it the steak and mashed potatoes were really good!!!! My husband got a steak and the grites they were Also good.